The individual load carrying equipment (ILCE) is intended for use in hot, temperate, and cold-wet regions of the world. It is not for use in cold-dry arctic regions. 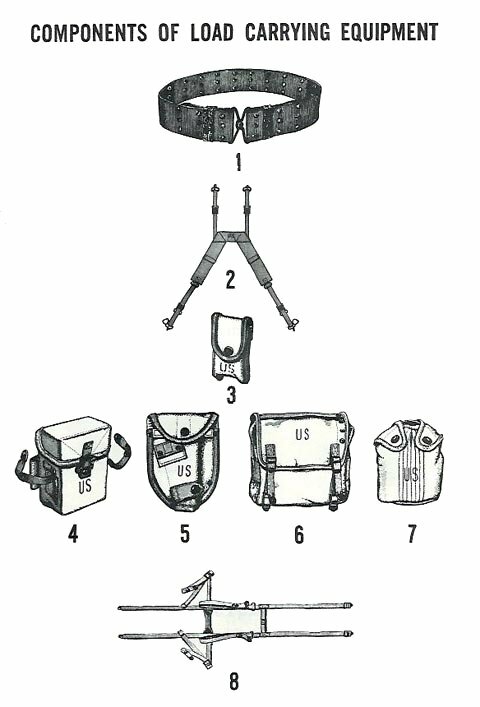 The pistol belt helps to support the field pack and is used to carry the intrenching tool and carrier, ammunition pouches, canteen and canteen cover, and first aid or compass case. The intrenching tool carrier is made of olive drab cotton duck material and is attached to the pistol belt by means of two attaching clips located on the back. An attachment for carrying the bayonet or bayonet knife scabbard is located on the front of the carrier. The sleeping bag carrier is designed so that the sleeping bag and other sleeping equipment can be carried on the back above the field pack. By means of a quick-release system, sleeping equipment can be dropped quickly in case of emergency. The first aid case is used to carry either a field dressing or an unmounted magnetic compass. The ammunition case is a shortened version of the universal ammunition case. It is designed to carry four 20-round magazines used with the M-16 rifle. The canteen cover accommodates a one-quart canteen and a cup. The lining on the inside of the canteen cover should be kept wet during hot weather in order to help keep the water in the canteen cool. The cover should be kept dry during cold weather, however, as the lining material provides limited protection in preventing the water in the canteen from freezing. The ammunition pouch is designed to carry any of the basic loads of ammunition. But with special weapons, it may be necessary to carry more ammunition than the pouches will accommodate. When extra ammunition is necessary, bandoleers of ammunition may be carried in a cross-chest manner. To place bandoleers of ammunition in the ammunition pouches, make a neat bundle by folding the bandoleers accordion-fashion and placing them in the pouches with the bandoleer straps at the top. This method permits the bandoleers to be inserted and removed easily. The suspenders are used to support, the field pack and the pistol belt. The shoulder pads should be centered on the shoulders in order to distribute the weight of the load evenly. The suspenders may be worn without the field pack. When wearing the suspenders without the field pack, the suspender straps should be attached directly to the pistol belt. To keep the weight of the load evenly on both shoulders, attach the rear suspender straps at even spaces from the center of the rear of the pistol belt. Military specification MIL-B-40158 covers an adjustable individual equipment belt made from olive drab cotton webbing and miscellaneous metallic hardware. Military specification MIL-C-40159 covers an ammunition pouch designed to carry any of the basic loads of ammunition. 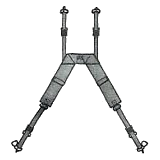 Military specification MIL-C-40161 covers an intrenching tool carrier fabricated of olive drab cotton duck. Military specification MIL-C-40162 covers a canteen cover fabricated from cotton duck, and pile or felt liner material. Military specification MIL-C-40166 covers a cotton duck case used to carry either a field dressing or an unmounted magnetic compass. Military specification MIL-S-40157 covers a sleeping bag carrier fabricated of olive drab cotton webbing. Military specification MIL-S-40160 covers combat field pack suspenders fabricated of olive drab cotton webbing and drill cloth.